I’m not a great awards chaser although I am working towards DXCC using Logbook of the World and I noticed this evening that there’s a tab on eQSL marked ‘Awards’ which I’ve never been into before. I was quite surprised to see that I have over fifty confirmed countries on eQSL so I downloaded the appropriate certificate. I’ve just checked and I have 63 entities confirmed on Logbook of The World which is where my real interest lies. 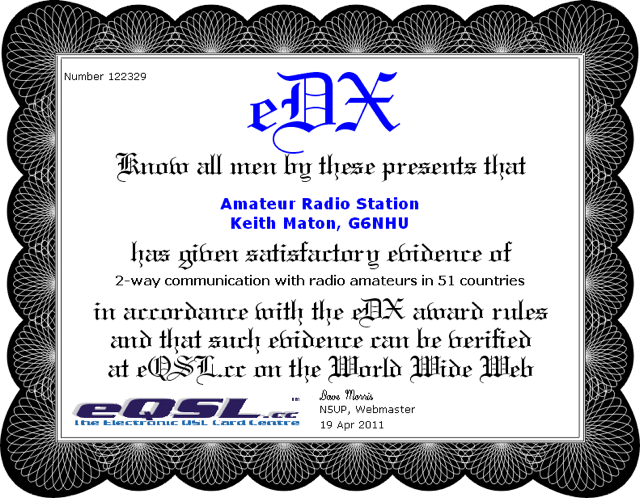 eQSL is OK but it’s not a ‘real’ DXCC. Well technically DXCC is an ARRL award so there is only one official DXCC and that’s the scheme they operate. I’m happy to QSL via any method though, be it eQSL, LoTW, real paper card or any other system. I suppose because the official DXCC scheme is an ARRL one, that’s what I consider to be ‘real’ DXCC. The eQSL award is no less of an accomplishment though and I enjoy receiving QSLs via there because they emulate paper cards (although many people don’t contribute and there’s a limited number of free card designs). Because I’m a Mac user I expected to have problems getting set up on LoTW but it was a breeze. The instructions on the web site are very easy to follow and my logging software supports both LoTW and eQSL uploading, both work perfectly well and I’ve had no problems getting both accounts set up and working. I was a little concerned about posting off the documents but that part of the process was also painless as I had a response within a couple of weeks. I’ve got a greater return of QSLs via LoTW than I have via eQSL so it can’t be that hard to set up! Hi Keith, very good, I’m one behind you on 49 confirmed, so frustrating as have worked 90 now, but not everyone is on eQSL and have not got LoTW fully working.